QuTech’s research is organized along three mission-driven science & technology roadmaps led by TU Delft Prinicipal Investigators (PIs). These roadmaps work towards the primary R&D goals of QuTech: developing scalable prototypes of quantum computers and quantum internet. In addition, QuTech has a fourth roadmap, Shared Technology Development (STD), led by TNO. In the Shared Development roadmap, technology developments are managed for the three mission-driven roadmaps of QuTech. 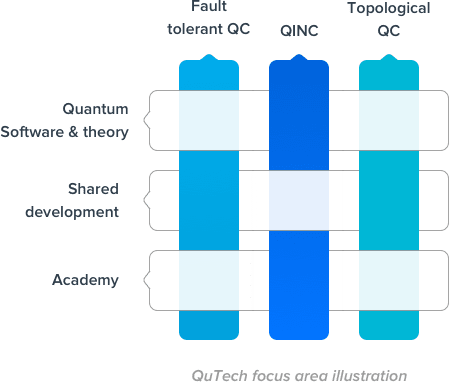 This roadmap facilitates the taking of quantum technology to market (technology push) and constitutes a portal to QuTech for third parties who want to access state-of-theart quantum technology (technology pull). Our goal is to develop new theory and methods to overcome the many challenges in realizing quantum technologies, and to develop useful quantum software applications. QuTech needs great students with the drive and talent to help us accelerate the effort to build a quantum computer and a large-scale quantum internet. We work together with talented students with in-depth knowledge in the areas of both quantum physics and computer science & engineering. Find out what QuTech Academy has to offer.